Talking mice. Completely impossible, (obviously), but fun. Now, if mice really could talk, do you think they would be the kind of creatures who devise committees for everything? Margery Sharp thinks so. At least, her mice have created the widely respected Prisoners' Aid Society of Mice. The task of this benevolent society is to befriend human prisoners in their cells, and perform daring rescue bids. As this story opens the Chairwoman of the Society is proposing the rescue of a Norwegian poet who is being held in grim conditions in the Black Castle. It goes without saying that the first thing they need for the job is a mouse who speaks Norwegian. Enter the elaborate Miss Bianca, who only ever travels by Diplomatic Bag! She is a Pet Mouse, you see. She lives in a porcelain grotto and wears a silver chain round her neck. Her Boy is the Diplomat's son, and it so happens that they are about to fly to Norway. She doesn't really want the job of recruiting strange Norwegian mice, but undertakes to do it because Bernard, the pantry mouse, asks her in the nicest possible way ... Is this a budding love affair? You'll have to read the book to find out. Nils took the chalk and marked top and bottom, then each side, with an N, an S, an E and a W. Then he gave the chalk back, and Miss Bianca again put a dot in the middle of the Moot-House - and again, out of sheer nervousness, drew a lady's hat round it. (The garden-party sort, with a wide brim and a wreath of roses.) Nils studied it respectfully. "That I'd call clear as daylight," said he. "You should ha'set your compass first." He laid a finger on one of the roses, "Them, I take it, would be duck-ponds?" "Oh, dear!" thought Miss Bianca. She knew perfectly well where the Moot-house stood - Bernard had explained everything so clearly - but she just couldn't, it seemed, put her knowledge on paper. And here was good brave Nils preparing to set forth with no more guide than a garden-party hat! "Yes," said Miss Bianca recklessly. "Those are duck-ponds ..."
A bit of a frolic. Quick and easy to read. Lots of fun. Have you seen the Walt Disney version? Same characters, Bernard and Miss Bianca. Different story. That's because Margery Sharp actually wrote six stories about these resourceful mice. 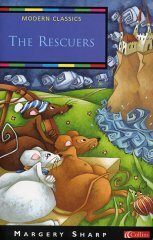 The book I review here, The Rescuers, is the first in the series. Walt Disney's cartoon actually covers a different story, The Rescuers and Miss Bianca.